bDepartment of Radiology (L.M.L. ), George Washington University Hospital, Washington, DC. SUMMARY: Most dementias begin insidiously, developing slowly and generally occurring in the elderly age group. The so-called rapidly progressive dementias constitute a different, diverse collection of conditions, many of which are reversible or treatable. For this reason, accurate identification and assessment of acute and subacute forms of dementia are critical to effective treatment; neuroimaging aids greatly in narrowing the diagnosis of these conditions. This second installment of a 2-part review of rapidly progressive dementias examines the use of imaging in an assortment of other etiologies in the differential diagnosis, from prion disease and neoplastic-related conditions to rare metabolic and other conditions such as Wernicke encephalopathy. In these clinical conditions, MR imaging has the potential to narrow this broad differential diagnosis and, at times, can definitively aid in the diagnosis of certain conditions on the basis of typical imaging patterns. Dementia features prominently as a common disability among the elderly and is only expected to increase with the aging population of developed countries worldwide. Dementia constitutes diverse combinations of a loss of normal executive function in decision making, a decline in memory encoding and retrieval, and an impairment of the ability to perform cognitive tasks. In the first part of this 2-part review of rapidly progressive dementias, the neurodegenerative conditions that feature prominently in the differential diagnosis of a presenile or rapidly progressive dementia were discussed. These include the common, inexorable dementias typically associated with old age such as Alzheimer dementia and dementia with Lewy bodies. As with any clinical evaluation, imaging cannot replace accurate and thorough physical examination and history, but it contributes greatly to discerning entities within the differential diagnosis of a rapidly progressive dementia. Rapidly progressive dementias can result from a variety of etiologies, and in this second review article, we discuss the remaining etiologies summarized in the differential diagnosis On-line Table cited in Part 1. One striking characteristic of the differential diagnosis for this clinical presentation of dementia is the tremendous diversity of entities encountered. This review discusses the role of neuroimaging, particularly MR imaging, in the diagnosis of a wide array of dementia-inducing conditions, including the following: prion disease such as Creutzfeldt-Jakob disease; infectious entities such as HIV-associated dementia; autoimmune and inflammatory conditions such as Hashimoto encephalopathy; malignancy-related conditions such as primary CNS lymphoma; and rare manifestations of other causes such as Wilson disease. In many of these clinical scenarios, MR imaging plays a deciding role in clarifying the clinical diagnosis. Other authors have recently reviewed, in greater detail, the clinical work-up of rapidly progressive dementias1,2; this article will focus on the consideration of these diseases when examining neuroimaging studies of rapidly progressive dementias. There are several rare disorders in which the pathophysiologic entity is the prion, a misfolded form of a normally found protein within the brain, which propagates itself by promoting changes in the conformation of the normal prion protein. The most common set of conditions involving the prion is Creutzfeldt-Jakob disease, which is either inherited in a familial fashion, sporadically occurring, or acquired through exposure. CJD may fall under both the neurodegenerative and infectious classifications; the latter is thought to occur in variant CJD or new-variant CJD, related to ingestion of mad-cow-infected beef.3 Of these types, the sporadic form is the most common, followed by genetic and acquired forms.2 This condition may differ clinically from many other conditions in the differential on the basis of its cerebellar dysfunction and common presence of myoclonus. Nevertheless, its clinical overlap with corticobasal degeneration and progressive supranuclear palsy necessitates the use of imaging to differentiate it from other rapidly progressive dementias. In younger patients with dementia symptoms, both infectious and inflammatory-related conditions are much more frequent than the neurodegenerative diseases. 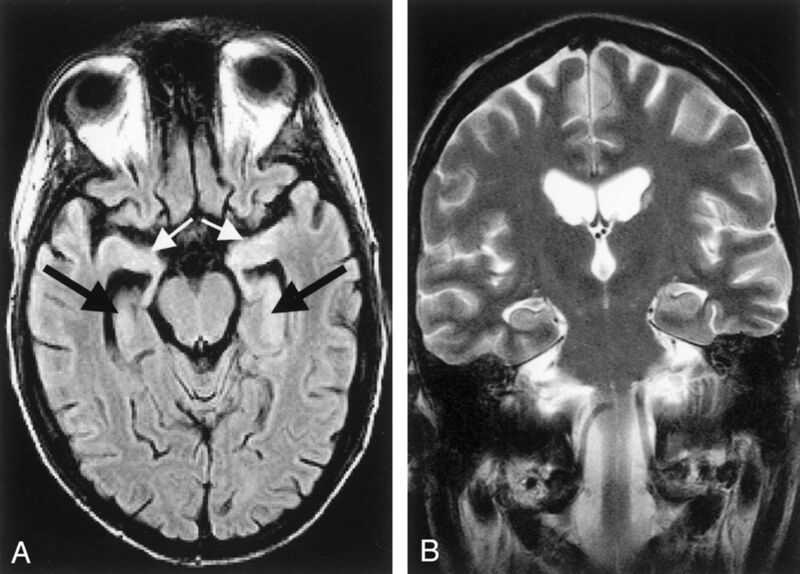 Encephalitis and other infections of the CNS are generally hyperacute in onset; when cognitive decline is present, these cognitive symptoms are likewise hyperacute in onset. In addition, encephalopathic symptoms with marked confusion and neuropsychiatric manifestations also point clinically to this diagnosis, as do non-neurologic manifestations of infection such as cutaneous or respiratory presentations. Readers are referred to the work of Almeida and Lautenschlager11 for a thorough clinical discussion of dementia associated with infections. The diagnosis of encephalitis in the acute setting may prove problematic: Clinical symptoms are generally nonspecific and may involve a variety of neurologic symptoms or none at all. While rarely presenting with dementia acutely, rapidly progressive dementia in younger individuals merits consideration of encephalitis. Even rapid polymerase chain reaction laboratory tests of herpes simplex may have negative findings in the very early stages of encephalitis, which make ancillary work-up imperative. MR imaging can reveal pathologic changes manifest as FLAIR and T2 hyperintensity within the temporal (particularly, medial), insular, and inferior frontal cortices in patients with herpes encephalitis.12,13 In the much less common Japanese encephalitis, these abnormalities tend to be seen in subcortical gray matter regions.13 Patchy enhancement with gadolinium administration indicates nonspecific inflammatory changes generally seen in encephalitis. 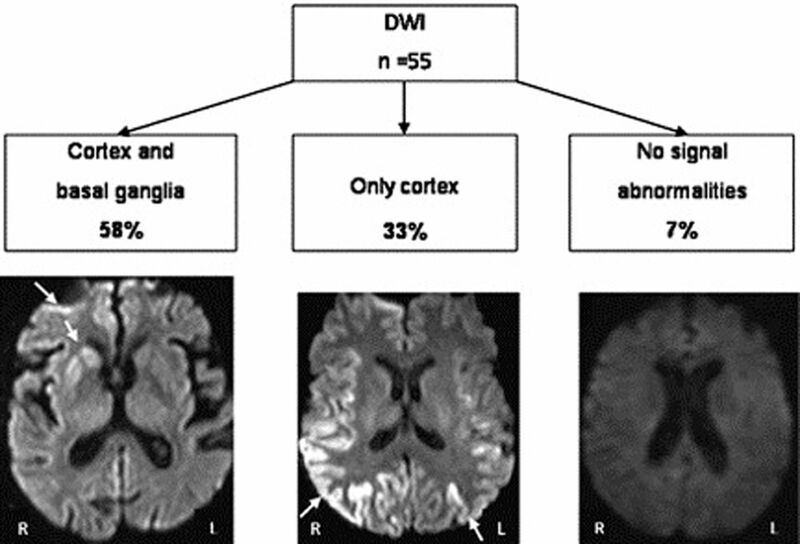 DWI augments the evaluation of encephalitis with earlier detection of changes than on conventional imaging, though it may not be as sensitive later in the clinical course.13⇓⇓–16 Restricted diffusion occurs in herpes encephalitis during the acute phase and appears less often in Japanese encephalitis, though other authors demonstrated diffusion changes in the thalamus in this condition.16,17 Moreover, magnetic-susceptibility-sensitive sequences (eg, gradient recalled-echo, susceptibility-weighted, and susceptibility angiography) may detect focal hemorrhage associated with sequelae of CNS infection. Nearly 1 in 20 patients with MS manifest dementia, but the prevalence of other cognitive disturbances is much more common and subtle.37 Most imaging reports of this phenomenon attribute the cognitive decline to the presence of nonspecific neuroanatomic atrophy, without particular observation of an affected structure.38 The reason for this generalized atrophy has been discussed and examined at great length—even in normal-appearing white matter in MS, there are detectable correlates of neuronal loss with decreased NAA on MR spectroscopy within both normal white and gray matter in patients with MS.39 Moreover, these measures of atrophy in patients with MS correlate with the progression of disability and were reviewed at great length by Anderson et al.39 Nevertheless, dementia in the setting of patients with known MS should be evaluated as with any other rapidly progressive dementia, with MS-related dementia as a diagnosis of exclusion. Other Inflammatory and Autoimmune Conditions. Celiac disease, an intolerance of food products containing gluten, often with the presence of autoantibodies to the enzyme tissue transglutaminase, may present with neurologic symptoms, including dementia, though those reported are quite varied, ranging from chronic headaches to ataxia.47,48 Oddly, these symptoms can occur without gastrointestinal involvement and may improve with dietary changes.49 MR imaging of the brain may reveal hyperintense T2-weighted posterior white matter foci with a reported prevalence of 1 in 5 in patients with celiac disease in 1 study, independent of the presence of neurologic symptoms.3,50 Most interesting, measured cerebral perfusion on SPECT imaging in 1 small study was significantly lower within several brain regions in patients with untreated celiac disease, while there was no significant difference between patients adhering to dietary restriction and controls.51 These findings suggest a process by which patients may sustain hypoperfusion with resultant brain injury, generating lesions visible on conventional MR imaging. Nevertheless, the evidence for and mechanism of neurologic involvement and the importance of MR imaging findings in celiac disease are controversial topics without conclusions. Intravascular lymphoma, a rare non-Hodgkin lymphoma, may likewise generate neurologic symptoms, including subacute dementia, concomitantly with cerebrovascular events.2 As a result of its intravascular source, CNS involvement is characterized by diffuse T2-weighted hyperintensity with patchy enhancement and, on occasion, edema.2,59 There are some diffusion changes consistent with ischemia in the setting of intravascular lymphoma.60 Angiography in these patients does not aid in the diagnosis because intravascular lymphoma appears consistent with vasculitis as a result of the intravascular malignancy.3 An antemortem diagnosis of intravascular lymphoma is particularly difficult. Most nutritional deficiencies that may manifest with neurologic symptoms are slowly progressive. The triad of dermatitis, diarrhea, and dementia, while rarely clinically observed now, characterizes pellagra or niacin deficiency. The role of imaging in this grouping of conditions is much more problematic than in the aforementioned diagnoses because imaging findings, if present, are generally nonspecific and may only offer a glimpse of the correct diagnosis, which may be more readily obtained with thorough history-taking and laboratory studies. Toxic Causes of Dementia-Like Symptoms. Most cases of neurotoxic exposure are clinically marked by fulminant encephalopathic symptoms of acute onset with a clear source rather than by symptoms of a rapidly progressive dementia. Nevertheless, there are certain imaging features that may support these toxic (generally heavy metal) exposures as the source of neurologic symptoms. T1-weighted hyperintensity within the basal ganglia implies deposition of metals such as iron or manganese.76 This finding on MR imaging has been reported in the globus pallidus of individuals exposed to manganese from their occupation as miners who developed cognitive impairment.77 The imaging findings in many other exposures are not well-established, and clinical suspicion and appropriate laboratory investigations remain the cornerstone of evaluation of these forms of progressive dementia. Impaired copper transportation in this autosomal recessive disorder may precipitate either liver disease or neurologic dysfunction, which in the absence of liver disease, presents later in early adulthood. For this reason, progressive dementia with or without other neurologic findings may occur in an atypical age group with Wilson disease. Classically seen on MR imaging is the accumulation of copper within the putamen and thalami reflected by T2-weighted hyperintensity without evidence of restricted diffusion.86 A few reports have described the presence of high signal intensity in T2-weighted images of the tegmentum and red nuclei to form the “face of the giant panda” and, inferiorly within the pons, to form the “face of the panda cub,” with relative hypointensity of the central portion with adjacent hyperintensity within the aqueduct.86⇓⇓–89 While these imaging findings may suggest impaired copper transportation as a cause, ultimately laboratory studies of copper and ceruloplasmin facilitate a definitive diagnosis. Presenile and rapidly progressive dementias are a diverse collection of conditions ranging from reversible to intransigent and rapidly progressive. Distinctions within this heterogeneous group are best accomplished with a careful and thorough clinical and laboratory examination and may be greatly aided by the use of neuroimaging, particularly MR imaging. We discussed, in the first part of this review, the more frequently encountered neurodegenerative causes of dementia, and in this second installment, we conclude our discussion of rapidly progressive dementias with a review of prion, infectious, inflammatory, autoimmune, neoplastic, and other conditions. The need for further investigation in several areas of clinical investigation of all these conditions is particularly important, especially because a large number of these conditions have overlapping imaging and clinical findings that obfuscate accurate diagnosis. Both the clinician and radiologist alike should be open to the possibility of alternate diagnoses in the setting of rapidly progressive presenile dementias, particularly because several diseases within this group benefit from urgent and specific treatment.